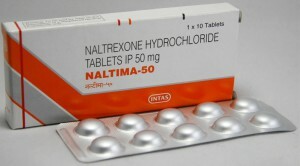 Buy Naltima 50mg (Naltrexone) Intas, Generic for Revia. Online Order. Pharmacological action – blocking opiate receptors. Naltrexone Competitively blocks the binding of agonists or displaces them from opiate receptors. Reduces or removes symptoms caused by / in the introduction of opiates. The greatest affinity is for the mu and kappa receptors. Revia, Effective when taken orally, in the digestive tract absorbed by 96%. In the liver, it is almost completely (95%) converted into pharmacologically active metabolites, incl. In 6-β-naltrexol. T1 / 2 naltrexone – 3.9 h, 6-β-naltrexol – 12.9 h; The average T1 / 2 depends on the dose and increases with prolonged use. Naltrexone and its metabolites are excreted mainly by the kidneys and with feces (undergoes intestinal-hepatic circulation). The total Cl is 1.5 l / min. Begins to act after 1-2 hours. With a simultaneous long-term appointment, it prevents the development of physical dependence on morphine, heroin and other opiates. In a dose of 50 mg blocks the pharmacological effects of 25 mg iv of injected heroin for 24 hours, a double dose (100 mg) for 48 hours, and 150 mg for 3 days. Long-term appointment does not cause tolerance and dependence. The combination with large doses of opioids results in an increased release of histamine with a characteristic clinical picture (facial flushing, itching, rash). In patients with opioid dependence causes an attack of abstinence. When alcoholism binds to opioid receptors and blocks the effects of endorphins. Reduces alcohol consumption and prevents relapses within 6 months after the 12-week course of therapy (the success of treatment depends on the patient’s consent and his interaction with the doctor). You can order generic version of Revia, using enquiry form of our website, we sell Naltrexone 50 mg in tablet, under brand name: Naltima, made by Intas, you can see photo at start of page. Also we offer another generic version of Naltrexone: Nodict 50mg .